I am extending a special offer to all of my patients. All nutritional supplements contained in this email are being sold to patients at a 30% reduced price. We are offering these nutrients as we have overstocked and need room on our shelves for new nutrients. If these are products you are using or would like to use, this would be a great opportunity to save some money. If you are interested in purchasing any of the valuable items discussed, please be sure to order now as quantaties are limited. Alpha Lipoic Acid (100mg) is a universal antioxidant that supports glucose transport and energy metabolism. Clinical trials in diabetics have documented the nutritional safety and benefits of ALA for aiding blood sugar metabolism. It also potentiates L-glutathione for detoxification, as well as chelates heavy metals. Directions: Adults take 1 to 2 tablets daily, or as directed by your healthcare professional. Pyridoxine-Alpha Ketoglutarate aids detoxification and athletic (exercise) performance. Alpha-Ketoglutaric acid is a natural metabolite in the human body which helps fuel energy production in cells, enhance oxygen utilization, and prevent lactic acid accumulation in muscles. Each tablet supplies 300 mg. Alpha-Ketoglutaric acid and 5 mg. of Pyridoxine (Vitamin B6). Directions: Adults take 1 tablet three times daily, or as directed by your healthcare professional. EPA promotes a healthy cardiovascular system by regulating the formation of prostaglandins, which regulate cell activity. It is highly anti-inflammatory and a natural substitute for aspirin and NSAIDS. EPA also reduces cholesterol levels. Two capsules provide 805 mg. EPA and 200 mg. DHA. Directions: Two soft gels daily, with food, or as directed by your healthcare professional. Cod Liver Oil differs from other fish oils in that it contains vitamin A and vitamin D. Directions: Take one teaspoonful daily at mealtime. Black Elderberry Extract is an herbal product that is effective against respiratory infections, and may be especially useful when traveling by plane to resist catching infections diseases. Contains 279 mg of elderberry extract per teaspoon. Also contains honey, glycerin, and citric acid. Directions: Take 2 to 4 tablespoons daily, or as directed by a physician. Echinacea Hydrastis- Glycerite Formula: Echinacea with Goldenseal (Hydrastis) is excellent as an immune stimulant and anti-viral/antibiotic– should be started as soon as signs of infection or flu manifest and continued for a full 7-10 days. Do not stay on Echinacea/Hydrastis indefinitely as a preventative or it will lose its effect. Directions: Shake well before using. Mix 15-30 drops in warm water and take this tea 1-5 times daily. Cellular Forte with IP-6 and Inositol boosts the body’s natural cellular defenses by increasing the levels o inositol phophates in the cells, which can dramatically increase Natural Killer Cell activity and strengthen the immune system. Each capsule supplies Inositol Hexaphophate (IP-6 bound) 800 mg., and Inositol 220 mg. Directions: Two tablets twice daily. Best taken on an empty stomach. Additional tablets may be taken as needed. Lomatium Root Tincture is indicated for respiratory viral infections. Use for head colds; lung problems, pneumonia, and influenza. Directions: 1 dropper per 100 lbs. body weight in 1 oz. hot water. Let stand in water 10 minutes to dissipate alcohol. Take up to three times daily. Montana Yewtip Tincture is used for the relief of Lyme Disease symptoms. Directions: 1 dropper per 100 lbs. body weight in 1 oz. hot water. Let stand in water 10 minutes to dissipate alcohol. Take up to three times daily. Spiro Extract is a synergistic formula of 6 rainforest botanicals which are traditionally used in South America for syphilis but are also designed for treatment of Lyme disease. Supplementing the diet with probiotics and digestive enzymes is advisable if this formula is used for longer than 30 days. Directions: Shake well before using. Take 60 drops (2ml) by mouth three times daily or as directed by a healthcare provider. Pure IGF Premium is a high potency extract of naturally occuring Growth Factors. As we age, our Human Growth Hormone production decreases, and thus, so does our production of vitality promoting Growth Factors. These Growth Factors play vital roles in aging, immune support, bone density, joint/connective tissue health, hair/skin/nails, endurance, fat loss, muscle function, libido/sexual function, stress reduction and energy. Directions: Take 1 tablet and hold in mouth under tongue until it disolves. For best results, use in the morning on an empty stomach. Pure IGF Ultimate is designed for the elite body builder or athlete. The Growth Factors found in this product supports the body in all areas of muscle recovery and regeneration. Directions: Shake well before each use. Hold 30 drops sublingually for 90 seconds per dose. Trienelle Daily Renewal Creme is a one-step, frangrance-free, comprehensive skin care regimen formulated by physicians and skin care experts to protect, nourish, and rejuvenate your skin. Advanced antioxidant nutrition, botanical extracts, and proven skin-rebuilding compounds combine to give you one of the most advanced products ever developed. Directions: Remove cap and depress inner survace with fingers to dispense. To nourish and rejuvenate the skin, apply twice daily to face, neck, chest, and other exposed skin, avoiding contact with the eyes. Trienelle Balanced Cleansing Mousse is used for cleansing normal to dry skin. This weightless mousse effortlessly removes dirt, makeup, and environmental pollutants without drying or irritating your skin. Leaves the skin perfectly prepared to absorb nutrients and moisture. Directions: Massage gently onto moistened skin, avoiding contact with the eyes. Rinse thoroughly with cool to lukewarm water. Fundamental Sulfur (MSM) is an indispensable structural component of many body tissues adding strength to hair and nails, and elasticity to the skin. Each capsule supplies Methylsulfonylmethane (MSM) 500 mg and Molybdenum as amino acid chelate 25 micrograms. Directions: Adults take 1 tablet three times daily or as directed by physician. Trienelle Nightly Restoration Formula uses an advanced liposomal delivery system to flood your skin with a rich blend of antioxidant nutrients. Also dramatically boosts collagen production and skin cell turnover to erase fine lines, wrinkles, age spots, and other signs of aging. Rich in natural, skin-loving lipids and botanical extracts, it leaves your skin smoother, healthier and younger-looking. Directions: Apply liberally to cleansed face and neck before retiring, avoiding direct contact with the eyes. Trienelle Cleansing Sponges. Contains 1 sponge per package. Each sponge is 3″ x 3″ and can be used repeatedly. Carrasyn Wound Gel is a non-oily hydrogel for the management of many skin conditions. Contains multiple ingredients, including Acemannan from Aloe Vera. It has the unique ability to regulate the amount of moisture present, either donating moisture to dry wounds or skin or absorbing exudate from wet wounds. Suggested Use: Use daily to moisturize extremely dry skin or to stop the paina nd start the healing of minor cuts, burns, and scrapes. 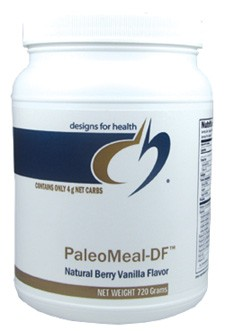 PaleoMeal-DF is a dairy-free, hypoallergenic vegetable blend of pea and rice protein ideal for patients with sensitivity to any of the components of milk such as casein. Minerals and CLA, involved in sugar and insulin metabolism, were added to this formula. These minerals are true chelates from Albion Advanced Nutrition. This protein blend is very easily digested, and has an excellent amino acid profile. This blend was also chosen for its smooth texture, pleasant taste and is gluten, and lactose-free. It has been assayed and shown to have non-detectable levels of lectins. Directions: Mix 40 grams (approx. two scoops) in eight ounces of water or any other beverage per day, or as directed by your healthcare provider. Cesium contains 500 mg of Cesium Chloride per capsule. Contains no yeast, sugar, dye, or preservative. PharmaGaba-Pro (Gamma-aminobutyric acid) is a major neurotransmitter widely distributed throughout the central nervous system. Because too much excitation can lead to irritability, restlessness, sleeplessness, and spasmodic movements, this excitation needs to be balanced with inhibition. GABA- the most important inhibitory neurotransmitter in the brain- can provide this inhibition, acting like a “brake” during times of runaway stress. In addition, studies also indicate GABA can promote relaxation and enhance sleep. Directions: Take 1 capsule one to three times daily or as recommended by your healthcare provider.